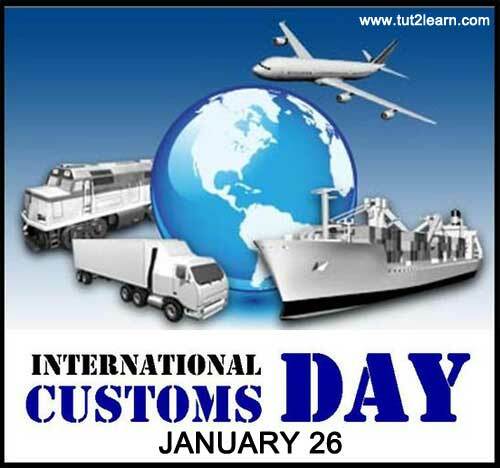 Every year January 26 celebrated as International Customs Day (ICD). It recognizes the role of custom officials and agencies in maintaining border security. It focuses on the working conditions and challenges that customs officers face in their jobs. World Customs Organization (WCO), having over 177 custom administration members, is called as the only intergovernmental organization which solely highlights on the customs matters. World Customs Organization was established in the year 1952 as an autonomous body to enhance the efficacy and effectiveness of the customs administrations all across the world. It is celebrated to enhance the effectiveness and efficacy of the member customs administrations. To innovatively assist the member custom administrations to actively contribute to the custom development. To achieve the international level goals. To enhance the revenue collection, community protection, national security and trade statistics collection. Instituted by the World Customs Organization (WCO), International Customs Day is held on January 26, which commemorates the day in 1953 when the inaugural session of the Customs Cooperation Council (CCC) was held in Brussels, Belgium. Seventeen European countries attended this session. In 1994 the CCC was renamed World Customs Organization (WCO) and today custom organizations from 179 countries are WCO members. International customs day is celebrated every year using different themes to focus on the particular event. The theme of the celebration of international customs day 2009 was “Customs and the environment: protecting our natural heritage”. The theme of the celebration of international customs day 2010 was “Customs and Business: improving performance through partnerships”. The theme of the celebration of international customs day 2011 was “Knowledge, a catalyst for Customs Excellence” to effectively implement the mandatory services by the customs fraternity. The theme of the celebration of international customs day 2012 was “Borders divide, Customs connects”. The theme of the celebration of international customs day 2013 was “Innovation for Customs progress”. The theme of the celebration of international customs day 2014 was “Communication: sharing information for better cooperation”. The theme of the celebration of international customs day 2015 was “Coordinated Border Management: an inclusive approach for connecting stakeholders”. The theme of the celebration of international customs day 2016 would be “Digital Customs: Progressive Engagement”.